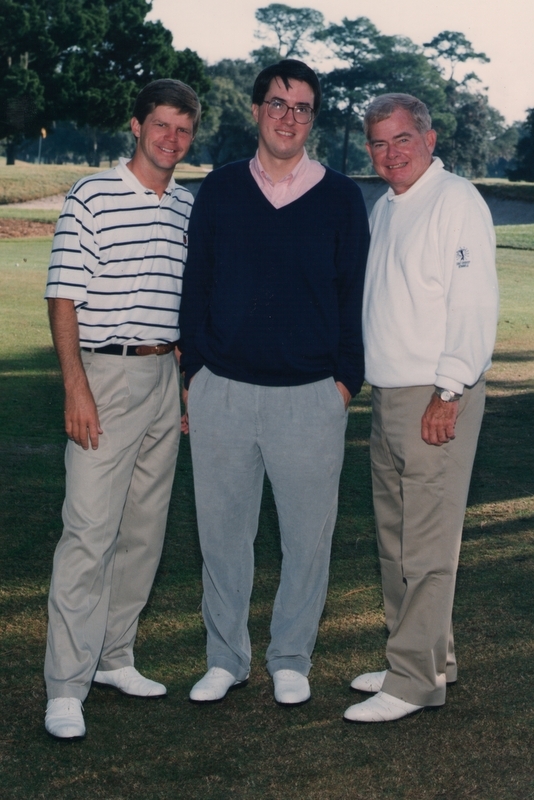 The teachers at the first golf school I attended, at Sea Island in 1991, were Scott Davenport, on the left, and Jack Lumpkin, on the right. I didn’t own any golf shirts yet, and those pants are corduroys. Also: huge glasses. I started playing golf in 1991, when I was thirty-six. A couple of months later, as I sat in my office pretending to work, I found myself gazing dreamily at an advertisement in the back pages of a golf magazine. The advertisement was for a golf school. I realized immediately that what I needed more than anything was to place myself in the hands of highly skilled teachers, who would transform me from a bumbling chopper into a champion. I bought a paperback book called The Guide to Golf Schools & Camps, and spent several days thumbing through it. It listed schools for children, women, left-handers, families, old people, high handicappers, low handicappers, people with disabilities, people interested in working only on their short game, and others. The schools were in places like Florida, California, Hawaii, Mexico, Jamaica, the Bahamas, Spain, the Canary Islands, the Dominican Republic, and Kansas. In the end, the listing I found the most appealing was for Golf Digest Schools, a sister company to the magazine. (At that time, I had no connection to Golf Digest; I later became a contributing editor.) After several days of happy deliberation, I settled on a mid-November session at the Sea Island Golf Club, in Georgia, which had a teaching facility with a high-tech video studio, an enormous driving range with target greens and fairways, covered hitting stalls, and a staff of experienced teachers. I sent in my deposit and made airplane reservations. When I told my friends that I was going to golf school, some raised their eyebrows, some expressed envy, and some became apocalyptic. “I knew a guy who went to golf school,” a friend told me. “When he came back, his handicap was ten strokes higher, and it took him six months to get his game back to where it had been before.” I heard warnings often enough to make me worry slightly. But I figured that my game was already so lousy that the downside risk was fairly low. During the weeks before my departure, the mail brought several packages from Golf Digest. One contained special scorecards that I was supposed to fill out and send in for computer analysis. (I eagerly did.) Another warned me not to wear bifocals during my lessons. (I might not be able to tell which ball I was supposed to hit.) Another contained a list of the names, occupations, addresses, and handicaps of my eleven fellow students. (My handicap at the time, twenty-four, placed me roughly in the middle of the class.) Another contained a questionnaire concerning my goals as a golfer. (I said I wanted to become “consistent.”) I packed my suitcase two days early. I scrubbed the heads of my golf clubs with steel wool and dishwashing detergent, and I cleaned the grooves with toothpicks. I filled the ball pocket of my golf bag with balls that cost twice as much as the kind I usually played with. The night before I left, I lay awake for hours, waiting for my alarm to go off. I felt as excited as if I were fifteen years old and on my way to screwing school. I was thinking about all that this afternoon, because my home course opens tomorrow, and I’m as excited as if I were thirty-six years old and on my way to Sea Island. I’ve taken twenty strokes off my handicap during the twenty-two years since that first session, and, although I fully intend to start adding those strokes back, beginning tomorrow, I’m not expecting to sleep much tonight. 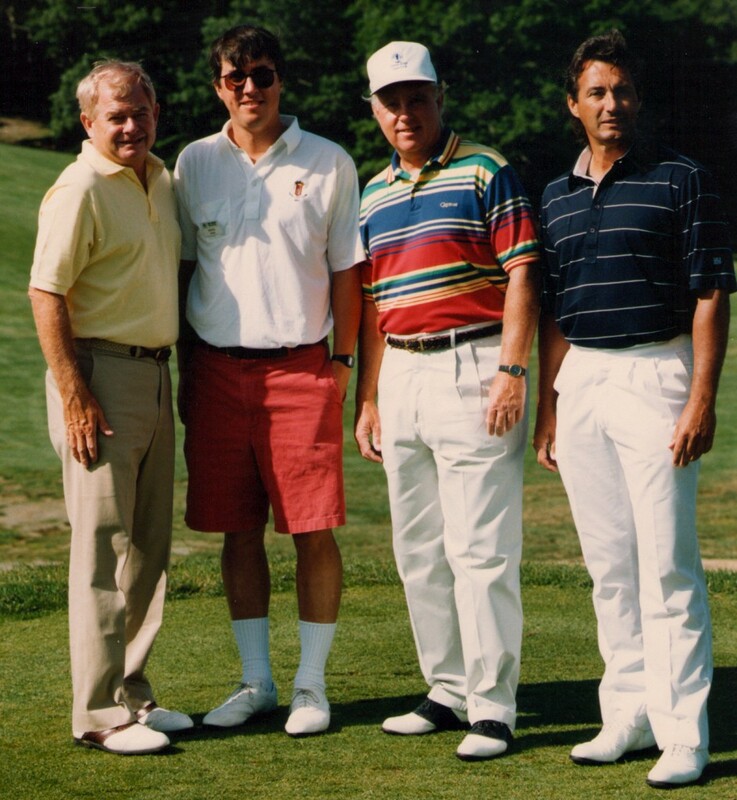 This photo is from my second trip to a Golf Digest golf school, on Cape Cod during the summer of 1992. The man on the left is Jack Lumpkin, who was also the head teacher at Sea Island. Check out my super-sized sunglasses and tautly pulled-up socks! Partial credit for non-pleated shorts, however. And by then I owned a golf shirt, which I had bought on my first golf trip to Scotland, a couple of months before. This entry was posted in Instruction and tagged Golf Digest, Golf Digest Schools, Jack Lumpkin, Sea Island Golf Club by David Owen. Bookmark the permalink. I am currently counting the minutes until I get to head to the course for my first 9 holes of the year (time constraints mean it cannot be 18…) and I am unable to sit still. Enjoy opening day and have a wonderful season.